As we have transitioned into another new year, the seventh year of WestToast (and it's predecessor The Oregon Wine Blog), we find ourselves once again with the opportunity to reflect on the previous 12 months. While 2013 wasn't the most active blog-wise for our team, the dip in post frequency was directly correlated with some pretty damn fantastic milestones for our staff. New jobs, new friends, new houses, new marriages, new beginnings, and new relationships have blessed the staff -- Jesse, Clare, Andrea, Rick, Micheal, and myself -- and at the same time have afforded some memorable wine, beer and spirits moments to share with you. As we have done in previous years, I'm pleased to share with you the "Best of 2013" from the eyes of our team. This time of the year as I write my annual “Best of” post for WestToast, I find myself saying the same thing I have said since moving to the California wine country...I feel very grateful to live where I live. This year provided many new experiences in wine country and many new delicious wines. It also continued many relationships with wineries and winemakers that have furthered my education about wine and my opportunity to learn the back end of the wine industry. And while I normally try to pick a wine that stood above all the rest, this year nothing tops the experience of traveling to Oregon for the Fourth of July and drinking wine, cider, and craft beer the way it was meant to be enjoyed, with great friends! Over the holiday, Katie and I traveled to the Oregon coast to spend a week celebrating and reuniting with family from around the country. Since we had made the long trek, we arranged to connect with good friends and fellow WestToast writers. We started out by meeting up at Willamette Valley Vineyards, which seemed fitting as it was the core inspiration for writing about wine. We enjoyed a tour of the caves, private tasting room, and settled down on the patio overlooking their estate vines and tasting through the tasting menu and a host of library wines. Our friend Chris had also provided some delicious snacks that made for a wonderful start to the day. From there we traveled back to the Corvallis area with stops at 2 Towns Ciderhouse, my first experience with cider, and longtime friend and supporter of the WestToast crew, Block 15 Brewery. We ended the day with a great dinner at Clare’s house and continued the cheerful drinking. At both places we were able to tour the facilities and taste through a plethora of craft beverages. One of the things I love about wine is enjoying it with friends. Spending the day with some dear friends we’ve known for years and making some new ones is exactly what it is about. There was great conversation, plenty of laughs, sarcasm, and a day worthy of the top WestToast experience of the year. Cheers to you all, I hope you get to raise a glass with the ones you love. 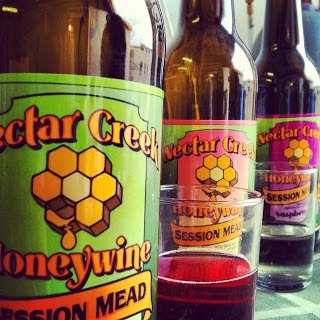 My favorite for 2013 was taking a tour at Nectar Creek Honeywine in Corvallis. Beyond being treated to an in-depth lesson on the making of mead, we were given the opportunity to sample a unique and amazing product. Brothers Nick and Phil Lorenz have been adding their own creative statement to the PNW brewing scene for over a year now, and it has been an amazing run so far. I highly recommend the ginger mead in particular, and am looking forward in 2014 to tasting some of their new offerings, including hibiscus and their wildflower mead aged in bourbon barrels. 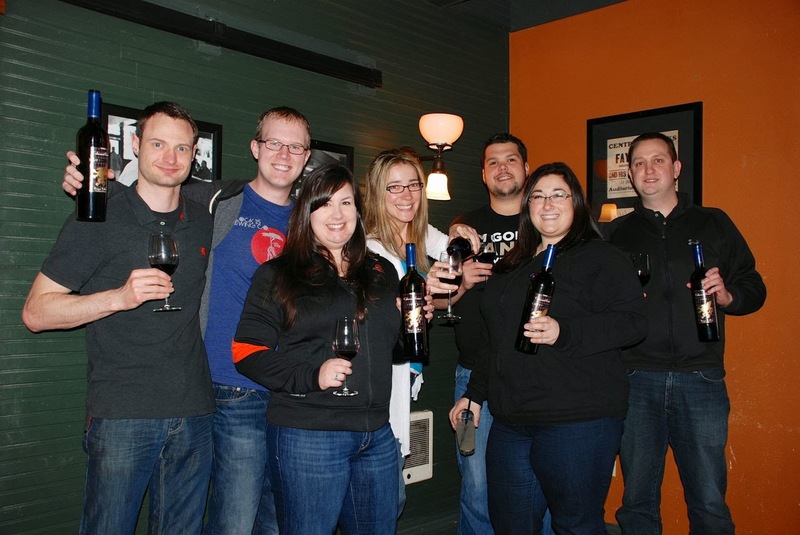 In March of 2013, our staff had a very special weekend: a chance to gather with friends of the blog, five consecutive vintages of the Griffin Creek Cabernet Franc, and tell the world what we think. The Griffin Creek Cab Franc is a meaningful wine for us; it's the wine that turned Rick into an aficionado, and, the producing winery has been instrumental in our blog over the years. I was happy to dig out the 2005, 2006, 2007, 2008, and 2009 vintages from my cellar, gather in the bustling town of Centralia, WA, and share them with friends. As you know from reading our blog, the people and the experiences are more important then the wine; add an awesome wine with amazing people and a special experience and this writer is in heaven. That's what the weekend was all about and why it's my favorite experience of the past year. At the end of the day, though, a vertical comparison is a chance to see how different environmental factors impact the crop. You take the same fruit, the same winemaker, and the same production methods over the course of five years of weather patterns and see what happens. 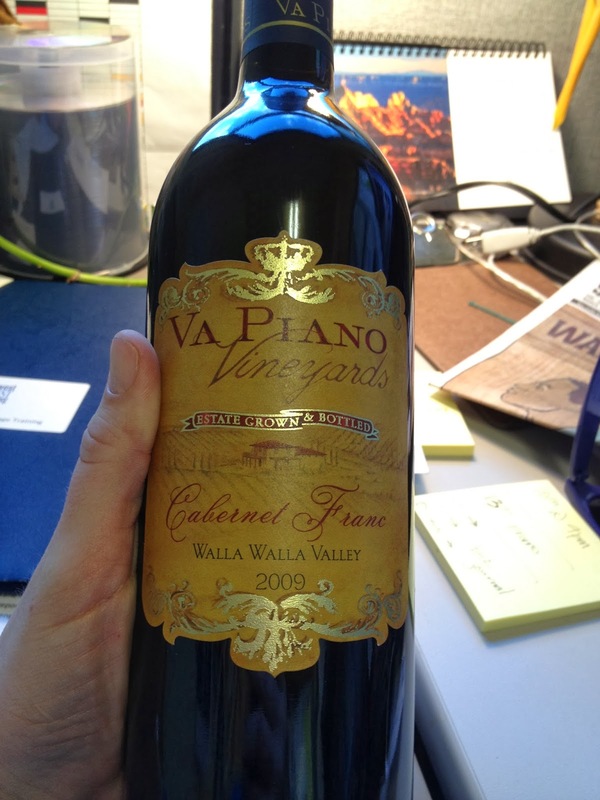 In this case, while we enjoyed all five vintages, the 2008 won the day. An exciting nose, an elegant mouthfeel, and a wine that stands up to food as well as one that is enjoyable rolling solo. Pick up some of the current vintage and enjoy a delicious Southern Oregon big red. When thinking of my favorite experience this year, it was kind of tough. Normally I make it a point to venture out quite a bit and try new things, but that didn't happen as much with a wedding to plan for and all. Instead, I accidentally found my favorite go-to brewery. It's not fair because I've barely ever written about them, but Hopworks Urban Brewery is my best-of the year. Why? They're pretty much everything I like wrapped into one. Phenomenal beer, excellent food, bike-themed, sustainable, the first brewery I take visitors to from out of town, and their beer completely won people over at my wedding. I'll get into that last part soon, but look forward to hearing about their HUB Lager and Velvet ESB. A special shout out goes to the Russian Imperial Stout I had a couple of nights ago. This post has literally been years in the making. It is hard to believe that it has been four years since I was first introduced to the greatest that is Cooper Wine Company. Neary four years ago, the staff from WestToast (then The Oregon Wine Blog), had an incredible meal prepared and presented by Chef Magana at his restaurant at the time, Picazo 7Seventeen. It was at that dinner where I had, what remains one of the top 10 cabs I have had, to date - 2007 Cooper Cabernet Sauvignon. Oh the memories. You see for YEARS, I tried to find ways to procure Cooper wine, but it eluded me. But when I stumbled upon their Facebook page, I quickly became a follower, knowing it would only be a matter of time before I would be cradling a bottle of my own in my arms. Fast forward to December 12, 2012. I was at work, on Facebook, and I caught a surprise - in honour of 12/12/12, Neil Cooper was offering a case (12 bottles) of his 2009 Barrel Maker Red for $12/bottle, for the first 12 people to "like" that posting. I did not bat an eye, and saw that I was within the 12, somewhere between 7 and 10, and made sure I clicked "like" and there it was - my dream would be coming true, I would be able to have my own bottle(s) of Cooper Wine. The fact that still drooled over the wine should tell you something! So when my case arrived, I knew I needed to be careful and intentional about how I distributed this new-found treasure. I initially thought I should keep six bottles, but I wanted to share the goodness of Cooper with as many people as possible. I gave Josh either two or three, shared about with one of my bosses, and gave a couple of sporadic other people a bottle. When it came time for me to enjoy mine, we were in the early stages of 2013. I invited Andrew over. Having Andrew over for wine is always a lot of fun on my end, yet he always feels bad. He talks about the fact that he drinks wine because he can tell what he likes and what he doesn't like. And as a novice wine-drinker, it either tastes good or it doesn't. While I can get into the wine, he merely enjoys it, but that works doesn't it? The Barrel Maker Red from 2009 is simply an amazing bottle of wine - a rich, deep, red colour, that is a full-bodied red on the palate. Everyone who gave a bottle to, came back afterwards and said how much they enjoyed it. 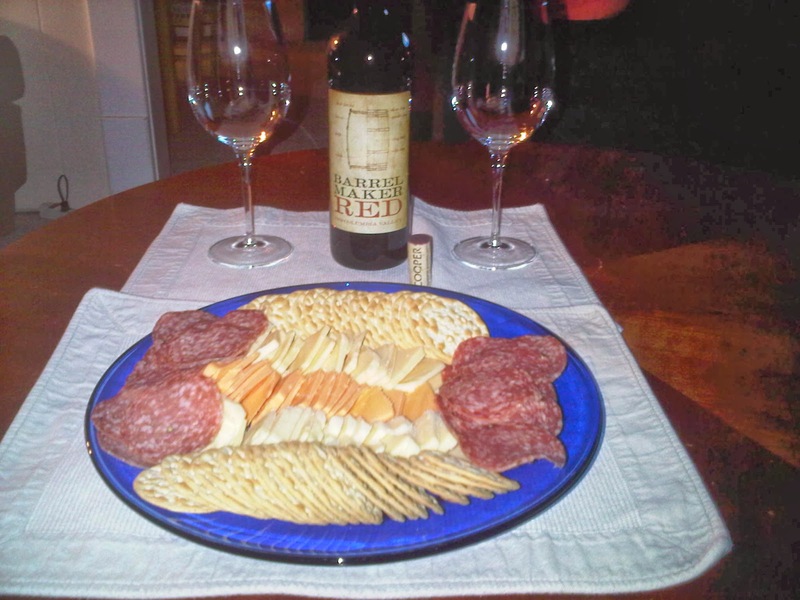 It is a wine that you can enjoy by itself in the evening, with a steak, or with a like platter like Andrew and I had. As I write this, I currently have one lone bottle left. When got downstairs thinking of a bottle to open, it no longer comes to mind as one to share with others. No, this last one shall be mine...all mine. With that, we jump into another year of sharing the best the West Coast has to offer. We all agree that each year has been better then the last, so I'm looking forward with anticipation of 2014's excellence.